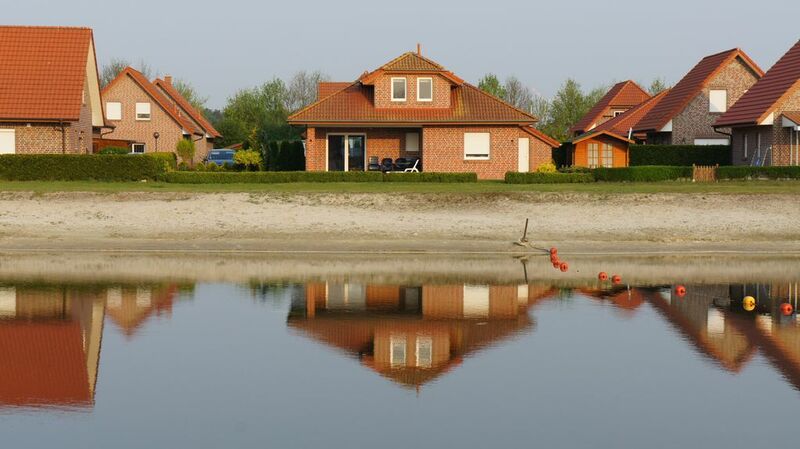 The holiday home 'Seeblickperle' is a detached, ground-floor bungalow with unobstructed views of the lake, in an exclusive beach location, in the Seepark Eiken in Walchum. There is a parking space at the house. The enclosed marine park is family friendly, and there's no through traffic. The house has cable TV and Wi-Fi, large living room with open kitchen (self-catering), a large covered terrace with direct access to the lake and a small sheltered terrace at the back of house front. There is a romantic and maritime flair. The accommodation is recommended for all seasons, the view of the lake once. Our holiday home "Seeblickperle" offers a classic Emsland holiday: Bicycle tours for sports enthusiasts, as well as for those seeking relaxation are possible in the idyllic landscape; Trips to the surrounding area are varied and testify to the adventurous spirit (Transrapid). The sea world Eiken is located in the heart of the Emsland, which guests many facilities on site offers directly: indoor pool with sauna, adventure playground, mini golf course, fishing pond, gastronomy with bowling. About the waterways of the Emsland arches maritime atmosphere, the North Sea seems to of channels to broadcast locks, folding and drawbridges landscape dominated space. With the Meyer Werft shipyard in Papenburg an encounter with pure luxury is guaranteed not to forget the little shopping center dominated by the water. Also, the amusement park castle Dankern offers plenty of fun and variety, hiking, canoeing, visits to castles, churches, mills and the beautiful fortress of our neighbors are nice Dutch by their immediate vicinity at any time. Feel-good holiday is guaranteed - whatever the weather! Pure Romance by the specular light string of houses opposite! The bathroom offers enough space and is also equipped with underfloor heating. Hairdryer and a basic package of towels are provided. More towels, as towels, washcloths, etc. Please bring your own from home. Ein sehr schönes Ferienhaus welches direkt am See liegt. Es ist alles vorhanden was man benötigt. Die Vermieter sind sehr nett und hilfsbereit. Vor allem für eine Familie mit Kindern zu empfehlen da man von der Terrasse den ganzen See überblicken kann. Sehr schönes Haus mit super guter Ausstattung. Hier kann man die Ruhe geniessen und sich super erholen. Der See läd zum Baden ein. Geeignet für Personen mit Gehbehinderung. Toller Urlaub mit den Enkelkinder. das Haus war sehr sauber und aufgeräumt, genug platz für vier Personen. Der See war für die Enkelkinder ein super Platz zum spielen und schwimmen(auch für Erwachsene).es war alles vorhanden was man für einen super Urlaub braucht. Das Haus ist genau so toll, wie beschrieben, es läßt keine Wünsche offen. Die Lage ist ebenfalls genial. Der Badesee war aufgrund des super Wetters einfach nur super, aber nicht überlaufen. Aber auch ein Spaziergang bei bedecktem Himmel macht Spaß. In der Umgebung gibt es genügend Einkaufs-Möglichkeiten. Man kann sich aufgrund der Ruhe super im Garten erholen. Ausflüge nach Papenburg, Haaren oder Bourtange lohnen sich sehr. Alles in Allem haben wir uns sehr wohl gefühlt und konnten uns sehr gut erholen. Wir empfehlen es definitv weiter ! Ein tolles Haus mit direkten See Blick von der Terrasse. Würde gerne im Sommer wieder kommen. Alles was man braucht findet man Vorort und Nachbar Ort. Private beach, amusement park castle Dankern, Meyer Werft Papenburg, family-friendly marine park system, a romantic holiday with guaranteed comfort and relaxation, information center on the Transrapid Lathen. Other Activities: High ropes course; Excavators Park.